View showing the winding River Avon and the wooded gorge. 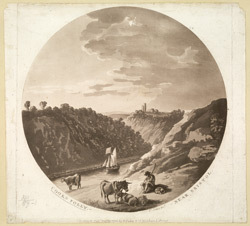 In the foreground there is a shepherd with animals and a ship making its way up the gorge. In the background is a landmark tower called 'Cooks Folly' which is located in Sneyd Park.